A British performance artist ate part of a Corgi (the Queen’s favorite breed of dog) live over the radio in protest over the royal family’s treatment of animals. The artist was angry that the RSPCA had not prosecuted Prince Philip for hunting and killing a fox. He ate three bites of the meat which was cooked with apples, onions and seasoning and said that it was “pretty disgusting”. The corgi died of natural causes. Sheer madness I tell you. This entry was posted on Wednesday, May 30th, 2007 at 4:00 am	and is filed under Dogs, National Dog, Cat & Pet Info, News for Cats, Dogs & Owners. You can follow any responses to this entry through the RSS 2.0 feed. Both comments and pings are currently closed. disgusting, why should the dog be eaten? I try to understand art, but I have corgis and any dog being eaten as a protest is beyond me. Don’t tell my corgis, they have enough bad dreams. Yeah, it looks like the Queen is really paying a lot of attention to his stupid sickening stunts too. What a fool this guy is. He’s wasting time, effort and money doing idiotic things that don’t really do any good for his “cause”. Whatever…he’s just another weirdo nutjob with a pointless agenda. NEXT! BY EATING THE POOR CORGI WHAT DID HE PROVE! NOTHING.. IT SURE DID NOT HAVE ANYTHING TO DO WITH THE PRINCE KILLING A FOX! I JUST PRAY THAT THE CORGI WAS NOT KILLED JUST SO HE COULD EAT IT! HE SHOULD BE JAILED! I DO NOT THINK THAT THE WAY THEY HUNT FOX IS RIGHT BECAUSE THEY DO NOT REALLY HUNT IT, THE DOGS DO AND THEN TEAR IT UP. I AGREE THIS IS WRONG, BUT THIS GUY MADE HIMSELF JUST AS WRONG, IF NOT WORSE! so, was that served with a ‘ fine chinti’? What part of “The corgi died of natural causes” did you not read? The AR people make fox hunting out to be cruel, but it is not. The object of the hunt is not to kill the fox. The hounds are doing what they were bred to do and the hunters follow on horseback over jumps. Sometimes the fox is killed by the hounds, not the hunter. Most of the time the fox goes to the den. This is an animal rights stunt by a wacko trying to get attention. Fox hunters do not eat foxes, but according to his website, he has eaten a fox and a swan in the past. http://www.markmcgowan.org/ yet he claims to be a vegiterian. Weather this is a hoax or not, he is clearly a very disterbed individual. Shame on the radio station for encouraging this. Shame on Yoko Ono for taking part too. 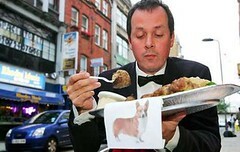 Mark McGowan continues, â€œIâ€™ve been planning it with two animal rights activists from Gloucestershire.” The dog in question died on a Corgi breeding farm in Southern England and is allegedly to be prepared and cooked for McGowan’s consumption by the two Gloucestershire ladies. So how did the dog die â€“ illness, old age? Mark doesnâ€™t know. Isnâ€™t he worried about eating a dog that has died of unknown causes? â€œI trust these two ladiesâ€, he says. SICK! DIGUSTING! HORRIFIC! WHAT A FREAK! Very very gross. I’m relieved the dog died of natural causes though.